RInkeby-Kista (SDO01) is one of 14 city districts (boroughs) in the City of Stockholm. It consists of four neighbourhood: Husby, Akalla, Kista, and Rinkeby (22405). Rinkeby is located approximately 13 km north west of the city centre. It takes 18 minutes by the underground from Rinkeby to reach Stockholm Central Railway Station. E18 delimits Rinkeby to the north and to the east. Beyound E18, there are green spaces. The huge green space to the north is called Järvafältet (the Järva field) which is a vital part of the green regional structure in the Stockholm region. To the west of Rinkeby lies the neighbourhood of Tensta. South of RInke, there are green spaces and also single housing areas. All in all, the land area (green spaces included) is 1.3 km2. 31 December 2012, the total population was 15 968, whereof 7 861 women and 8 107 men. Since 2003, the population has been stable. Education levels are lower in Rinkeby than in the City of Stockholm as a whole. It is mainly due to the neighbourhoods socio economic employment patterns, with higher proportions of residents working within the fields of transportation, hotel and restaurants, health care, and lower proportions of the residents work in business services, finance, education, and ICT as compared to the overall levels of the City of Stockholm. In some the former trades, formal education levels tend to be lower than in the latter ones. In Rinkeby, 21per cent of the residents 25-64 years old have a tertiary education, while the figure for all residents in the City of Stockholm is 55.7 per cent (ISCED 5 and 6 included). The employment rate is substantially lower than in the rest of the City of Stockholm. With an employment rate of 46.4 per cent for residents aged 20-64 are employed ( 52.6 per cent for men and 39.6 for women), Rinkeby belongs to the neighbourhood with the lowest rates in the entire County of Stockholm. And also significantly lower than the City average, which is 77 per cent. Unemployment rates are also substantially higher in Rinkeby than in the City of Stockholm as a whole: 10.1 per cent versus 3.4 per cent. Women’s unemployment rates are slightly higher than men’s. 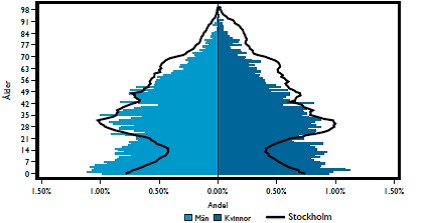 Rinkeby’s specific socio-economic patterns with low employment rates and low levels of education are reflected in the income levels. The average income is SEK 159 100 in Rinkeby ( 178 100 for men and 138 100 for women), whereas 339 200 in the City of Stockholm (2011). 31 December 2012, 90.5 per cent of the residents in Rinkeby had a so called foreign background, i.e. either born abroad or born in Sweden with both parents born abroad. Of the residents with foreign background in Rinkeby, 8 of 10 of the residents are of either Asian (38.7 per cent) or African (40.8 per cent) descent. The largest foreign born groups are: Somalia, Iraq, Turkey, Greece, Syria, Eritrea, Ethiopia, Bosnia and Hercegovina, Chile, Poland, Iran, Finland, Morocco, Lebanon, and Bangladesh. In 2012, 2 393 individuals moved in to Rinkeby, and 2 5530 moved out of Rinkeby. Almost half of these movements, 47.1 per cent, are registered as movements inside the City of Stockholm, i.e. from or to another neighbourhood within the City of Stockholm. Direct international movements are fewer but on par with the rest of the City of Stockholm: 13.5 per cent in movers, and 7.2 out movers respectively.